My motto for making the first lesson a success reminds me of my Girl Guide days: “Be Prepared”. Having made a few notes about my new pupil during the initial phone conversation, I tuck these away in the front of my diary and discreetly add to them as the lesson progresses. 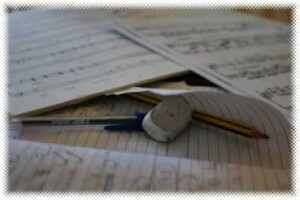 The other part of my preparation involves having my diary, a pen, a pencil – crucial for circling misplayed notes – and the course book sitting ready for my new pupil (if they’ve chosen to order it through me) along with a notebook with his name on the front and the date of the first lesson inside. Below the date I write: ‘crotchet – 1 beat, minim – 2 beats, dotted minim – 3 beats, semibreve – 4 beats’. I also write the words ‘treble clef sign’, ‘bass clef sign’ and ‘time signature’ and explain to my pupil that I would like him to learn these words – ideally by the following week, although I will keep going over them regularly. Anything else I feel the pupil or his parent should know is in the information sheet which contains detail of my ‘rules’ (the information sheet appears at the end of the article Your New Piano Pupil). I’ll make sure he takes one of these home if I haven’t already posted it to him. When the new pupil arrives at the front door, I always greet him or her by name … although I don’t follow that – as I know I should – by introducing myself. I should say: “Hello (new pupil’s name) I’m Mrs Hazell” or “Hello, I’m Jan”. It’s better to decide in advance how you’d like to be addressed – although, in this case, I don’t practise what I preach – and I must admit I think some of my pupils (particularly the teenagers) are unsure of what to call me. It was always going to be difficult for me to settle on one form of address when I started teaching, as I had some new piano students who already knew me personally and had been to the house before coming for lessons (because they were friends of my sons): these children had grown up calling me Jan. The ones I taught at school, however, saw me only as a teacher and therefore ‘Mrs Hazell’. It was particularly difficult when those who knew me personally would shout “Hi Jan” down the school corridor and I had to explain to them that this wasn’t really appropriate. Anyway, having directed the pupil into the ‘piano room’ (and in some cases, the parent into the hall), I invite him to sit on at the piano stool (or sometimes at a chair by the table to start with) and if necessary to take off his coat. I’ll then give him his notebook and explain its purpose and the importance of bringing it to the lesson every week. I also show him the course book and ask him to write his name at the front. (To avoid books which are left behind getting mixed up with my own copies). At this point, I generally have a brief chat (it has to be reasonably brief as there is a lot to get through in the first lesson) – maybe about what made him want to take up piano or what he enjoys most at school. Then – in the case of a child – I invite him to draw around his hands and number the fingers – as detailed in John W. Schaum Pre-A The Green Book. (Usually at this stage, it’s better to sit at the table). Children generally start to relax when they’re given this task – especially if their ‘drawing’ goes badly with the weaker hand and they end up with wobbly-looking fingers. With an adult, I would merely explain how fingers are numbered and indicate these numbers both in The Green Book and in more advanced pieces of music. On the next few pages of The Green Book there are diagrams of the piano. I skip over these fairly quickly but draw attention to a few of the main points: firstly that black notes are arranged in groups of twos or threes on the piano, and secondly that in order to locate the ‘all important’ middle C you must look for a group of two – rather than three – black notes near the centre … and it’s the white note to the left of these. (That summarised explanation takes far longer to convey in reality). At this point, we generally move away from the table to sit facing the piano. 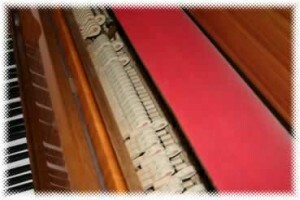 In an ideal world, this would be a good time to lift the lid and show the pupil how a piano works – i.e. that the key is attached to hammer and that when you press a key the hammer hits a string and this makes a sound. Unfortunately, as I’ve learned from experience, this type of hands-on explanation can be far too time-consuming especially with lively young children who will want to spend a while demonstrating this hammer action and – unless you’ve scheduled in an extra-long first lesson – would leave you short of time to get onto a piano-playing exercise. For this reason, I postpone the hammer-action explanation until a later lesson. Many children (and a few adults!) are unsure of their ‘rights’ and ‘lefts’. ‘You write with your right hand’ can help (only for right-handers of course) but these days, children tend to solve the problem by holding their thumbs and forefingers up at right-angles to one another and seeing the ‘L’-shape made by the left hand. 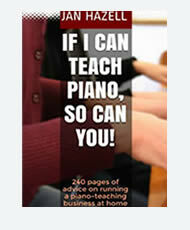 Having pointed out the location of middle C – both in the course book diagram and on the piano itself – I then go on to explain how the remaining keys are arranged in alphabetical order – D,E,F,G to the right – and B, A to the left (or going ‘down’). I am often amazed how difficult not only children, but adults too, find saying their alphabet in reverse. I remember at the age of around five or six I could recite my whole alphabet backwards; I wasn’t exceptional, several of my friends could do it too. However, having realised this is a problem for a lot of people, I make sure I tell them they’re certainly not alone and many of those I teach struggle with their alphabet – either forwards or backwards. I then try to ascertain if they’ve realised that the note below A is G as this is the ‘end’ of the musical alphabet. As usual, I prefer to ask a question first, rather than just state a fact – as this ensures that they’re really paying attention. (i.e. here I’d say: ‘what do you think you’d call the note before A?”). I quickly help if the answer is not forthcoming. Some of these points probably seem obvious – especially to anyone experienced in teaching music to kids (or teaching kids in general) – but I think sometimes we all need reminding of how easy it is for learners to feel inadequate or stupid if they don’t pick something up straight away.